A Few Paragraphs: Workers of the World Unite and Barbeque Some Steaks! Workers of the World Unite and Barbeque Some Steaks! 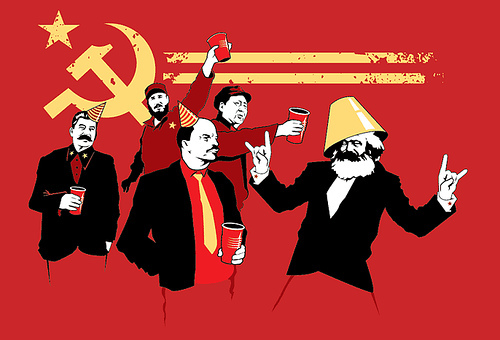 Getting down to the socialist groove on Labor Day! Happy Labor Day everybody, my favorite socialist holiday! Of course, we don't play up its connection to Marx and Engels these days but, yeah, Labor Day got started back when anarchists were throwing bombs, 12,000 troops were battling 250,000 laboring men in the Pullman Strike, and workers of the world were uniting. It was originally held on May Day too -- as it still is in most countries. But just when things looked bleakest for business tycoons, Grover Cleveland, our non-consecutive President, wisely placated the masses by moving Labor Day to September and making it a national beer-drinking holiday. And so, labor troubles were a thing of the past. But why September? Well, certainly to put some distance between the pleasant associations of brewskies and bar-b-que and those of "having nothing to lose but your chains" that it had on May 1st in the rest of the world. But more specifically, September was when they celebrated a tiny alternate labor day of their own in New York State, and President Cleveland had once been known as Governor Cleveland there. What could be more natural than just taking that particular labor day national?